The Benetton Group entered in Formula One as a sponsor company for Tyrrell in 1983, then Alfa Romeo in 1984 and 1985 and finally Toleman in 1985. Benetton Formula Ltd. was formed at the end of 1985 when the Toleman team was sold to the Benetton family. The team began with BMW engines and then later switched to Ford. The team was managed by Flavio Briatore from 1990 until 1997. Rocco Benetton, the youngest son of Luciano Benetton joined the team as aerodynamics engineer in 1998 and fired Briatore. He replaced him with Prodrive boss David Richards, who lasted only for a year when he too was fired, due to a disagreement with the Benetton family about future strategy. 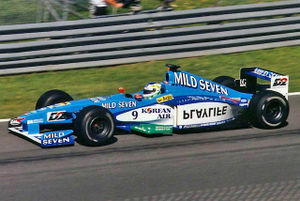 Following Richards' departure, Rocco Benetton managed the team for three years until its sale to Renault. Rocco Benetton successfully managed to achieve an unheard of salesprice in F1 terms. The Benetton team is best known for its success with Michael Schumacher, who accounts for 19 of the team's 27 career victories and their 2 drivers' championships. After switching to Renault engines, they also won the constructor's championship in 1995 with Schumacher and Johnny Herbert. After 1995, Schumacher moved to Ferrari along with Ross Brawn, Rory Byrne and 11 other key figures from his two championship winning seasons with Benetton. From this point, the Benetton team was never what it once was. On March 16, 2000, the team was sold to Renault for $120 million US. As part of their restructuring, Renault brought back Flavio Briatore as team manager. During their final season in 2001 the drivers, Jenson Button and Giancarlo Fisichella, were often on the back two rows of the grid. This was in part attributed to the new 111-degree wide angle engine. But as the Renault era approached, the cars' performance lifted. Towards the end of the season, Giancarlo Fisichella recorded a fine podium finish behind Michael Schumacher and David Coulthard. Continued development allowed Benetton to leave Formula 1 on something of a high. 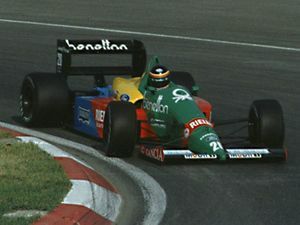 During the 1994 season, some rival teams claimed Benetton had found a way to violate the FIA-imposed ban on electronic aids, including Traction Control and Launch Control. On investigation, the FIA discovered "start sequence" (launch control) software in the Benetton B194 cars, and a variety of illegal software in rival teams' cars as well. FIA had no evidence the software was ever used, so teams found with the software received little to no punishment. No traction control software was found to be in the Benetton cars, however. Flavio Briatore, Benetton's chief in 1994, said in 2001 that "Our only mistake was that at the time we were too young and people were suspicious". During the 1994 season Benetton removed a fuel filter from the refueling rig used during pit stops. This may have resulted in a fire that took place during Jos Verstappen's first pitstop at Hockenheim. Johnny Herbert driving for Benetton in the 1995 Canadian Grand Prix. Benetton won the 1995 World Constructors' Championship title as a British team. Benetton Team had a United Kingdom license from 1986 to 1995 and an Italian license from 1996 to 2001. The Benetton family wanted this change of nationality in order to have an F1 team of their own country. The team was based in the UK throughout. Gerhard Berger - made first and last win for the team, at the 1986 Mexican Grand Prix and 1997 German Grand Prix. And he also made first podium finish at the 1986 San Marino Grand Prix. Teo Fabi - made first pole position for the team at the 1986 Austrian Grand Prix. Giancarlo Fisichella - made last pole position for the team at the 1998 Austrian Grand Prix and last podium finish at the 2001 Belgian Grand Prix. Roberto Moreno - made first 1–2 finish for the team at the 1990 Japanese Grand Prix with Nelson Piquet. Nelson Piquet - first (ex-)Formula One World Champion joined with the team. Michael Schumacher - won drivers' titles in the 1994 and 1995 seasons.